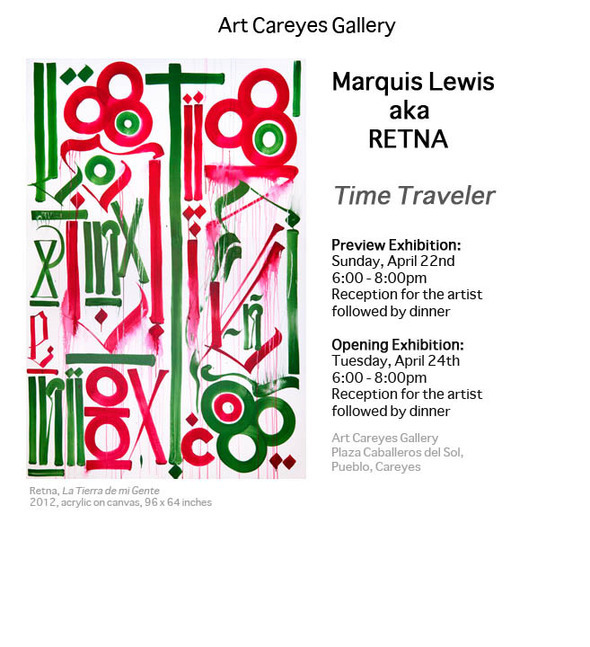 One of my favorite LA artists, Retna, opens his next show this weekend. Rather than New York or London, this time his work has migrated to the luxury resort, Costa Careyes, Mexico, between Puerto Vallarta and Manzanillo. Viejas del mercado's atmospheric video conjures a dark and urbanesque image of Retna's "Time Traveler" exhibition. Unusally, this time Viejas del mercado actually feature the artist in the trailer. RETNA: Time Traveler from viejas del mercado on Vimeo. "Time Traveler" is described as a "site-specific project" and is certainly the first urban art (graffiti) has been allowed near the idyllic Careyes property! Bravo RETNA! For once, I think claims that his work "transcends time and space, creating a global visual language," can be believed. Even in dense pieces, Retna let's his letters breathe as they demand their own space to be legible. And there's a discipline to his letter form that is ancient and primitive, much like the coastline of Careyes. 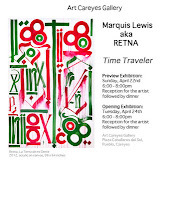 Hopefully, Retna will sell out this exhibition. VIP guests at Costa Careyes include Bill Gates, Seal and Heidi Klum, Simon le Bon and Quentin Tarantino. For fans, Retna will be present at both events. If you are interested in the lifestyles of the rich and famous, read this Departures article about the Mexican Riviera.